SINGAPORE - In preparation for a new residential precinct in Kallang, the authorities will treat the soil on the site of a gasworks plant that once powered the entire nation. 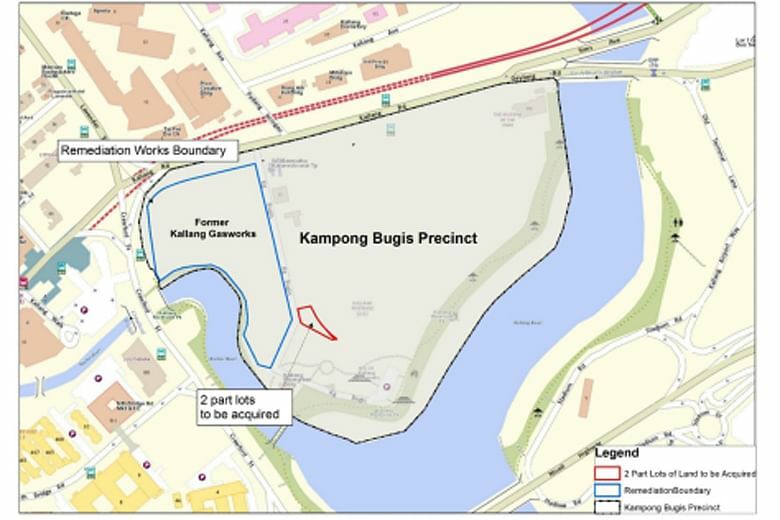 The Singapore Land Authority (SLA) called for a tender on Thursday (April 19) to conduct remediation works on the former site of Kallang Gasworks. It was constructed in 1862 to manufacture gas using coal, but ceased operations more than 130 years later. A new piped gas production plant, Senoko Gasworks, was opened by Singapore Power in July 1997. On the Kallang site, the plant occupied 3.14ha, around the size of three football fields and almost 20 per cent of the made-over Kampong Bugis district. In the next decade, the precinct will be redeveloped into a car-lite, waterfront district with about 4,000 new private residential units. To achieve this, the SLA also acquired a parcel of private land from Singapore-Johore Express, a transport company that ventured into property. The 914 sq m plot currently sites the company's showroom for its freehold Kallang Riverside condominium, which sits on the edge of the precinct facing the Singapore River. In a joint statement, the SLA and Urban Redevelopment Authority (URA) said environmental site assessments found chemicals in the soil typical of those in land used for gas production. The remediation, which will treat the soil using thermal methods and soil washing, will ensure that the quality of the soil will be suitable for its intended use, the agencies said. Nanyang Technological University engineering expert Fang Mingliang said that left untreated, the chemicals can contaminate ground water. The remediation works would require all the soil to be dug up and put in a reagent – “almost like a detergent”– so that oil elements can be removed, Assistant Professor Fang said. In addition, the site will be enclosed, so that vapours do not seep out and rain does not wash the contaminated soil to the river, he added. “People don’t need to be worried because the remediation plans are quite comprehensive and meet international standards for health and safety,” Prof Fang said. Similar works have been successfully carried out at former gasworks elsewhere, including an upscale retail district in Brisbane, Australia, and a luxury mixed-use space in King's Cross, London. Remediation works should be completed by 2022, but the tender for a master developer to oversee the development of the entire precinct should be out in the next one to two years, The Straits Times understands. The entire precinct should be completed in the next decade, said a URA spokesman. Kampong Bugis is one of three rejuvenated districts that the authorities unveiled last year. The other two are Holland Plain in Bukit Timah and Bayshore in East Coast. The futuristic towns, with their emphasis on fewer cars and more open public spaces, will bring a total of 19,000 new homes.